Posted on November 29, 2014 at 11:31 am. 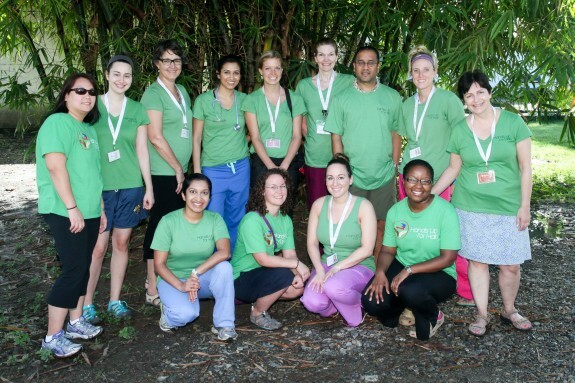 This was my seventh Global Health trip to Haiti, and I felt very confident leading this team of fourteen doctors, nurses and volunteers. We had been planning for months and preparing for weeks. 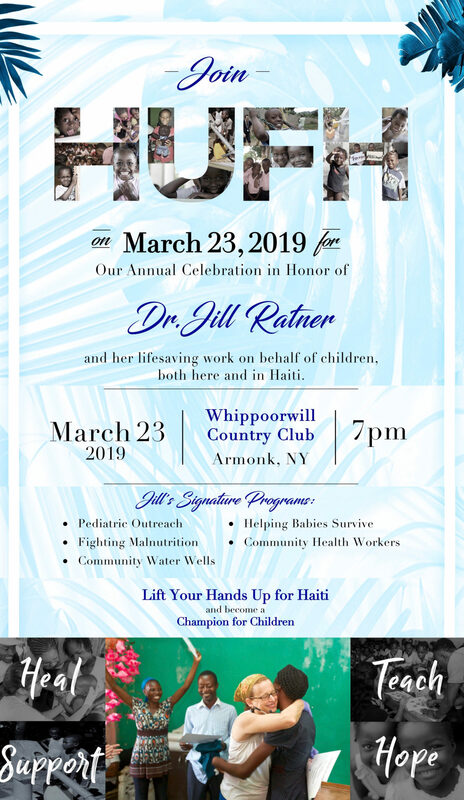 The plan was to arrive in Cap Haitien and then head west to the remote fishing region of Bas Limbe to run pediatric outreach clinics in the local villages. 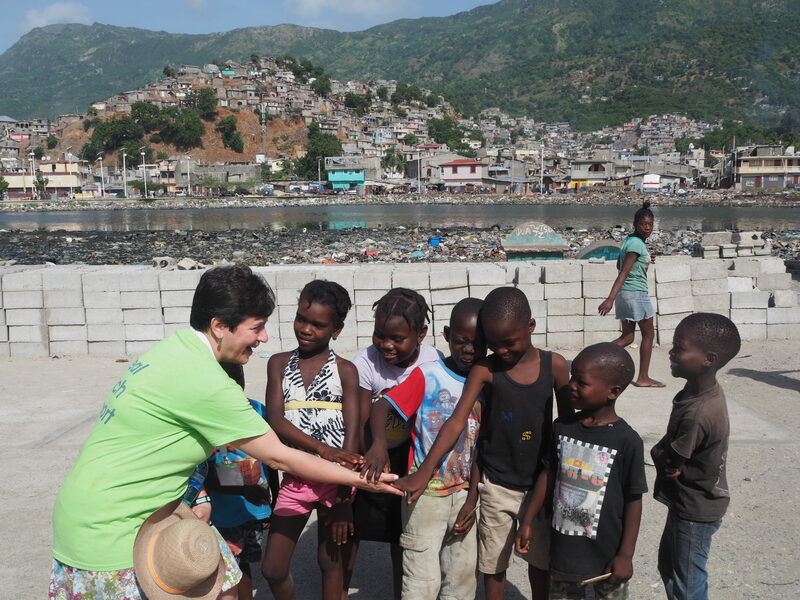 We would end the week back in Cap Haitien seeing patients in our clinic in the Shada slums. Nurse Judy McAvoy and I were experienced leaders and everyone was excited to be taking part in this mission. We were ready, but nature had other plans for our team. Our team arrived to a city saturated by days of rain. 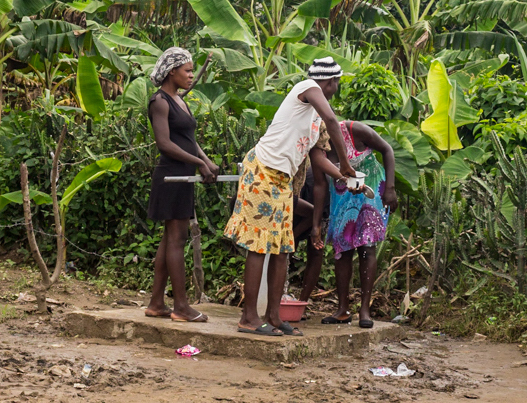 The forecast was unclear when we arrived, and the team piled into the waiting van for the two hour drive to the village of Bod me Limbe on the coast. Rain intensified along the way and travel became increasingly more difficult. The group of volunteers and Haitien translators arrived safely but soon realized that the plans for pediatric outreach were in doubt. Located right by the sea, waters had flooded the beach, the schoolyard, and was making travel by foot for the local families impossible. At the guest house at Haiti Village Halth, everyone dried off and enjoyed a dinner of steamed rice and chicken as Volunteer coordinator Thermitus Jean gave everyone lessons in Creole. The team then unpacked supplies and medications and prayed that the rain would stop. 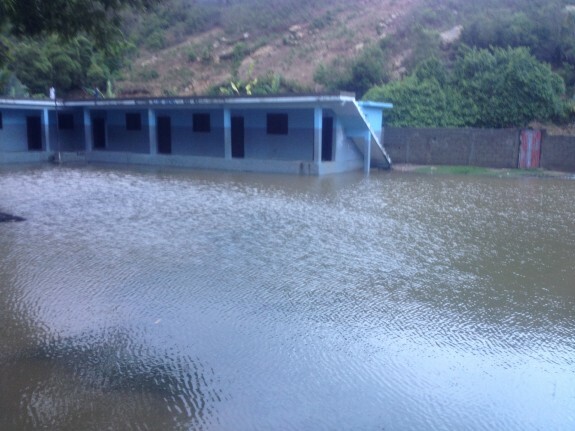 Flooded schoolyard adjacent to the clinic at Bod me Limbe. I had stayed behind in Cap Haitien with nurse Judy McAvoy to pick up photographer Audrey DeWys who was arriving separately. Judy and I were joined by Hope Bechard, a nurse from Canada who was staying in Haiti for three months as an intern for Hands Up for Haiti working on several projects. But the weather was forcing cancellations of flights and suddenly we found ourselves huddled down with our partners at Haiti Hospital Appeal in their volunteer village and separated from the rest of the team for two anxious days. We made ourselves useful by seeing patients at the neonatal unit and the Maison de Benediction school for children with disabilities. But the rain continued day and night and we began to worry about reuniting with the rest of the team. 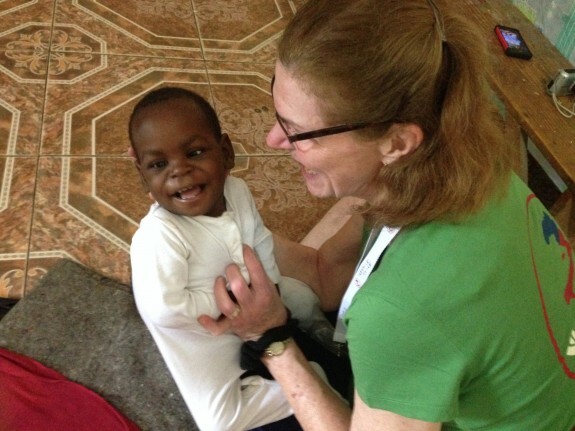 Nurse Judy McAvoy plays with one of the little ones at Maison de Benediction. Thanks to the leadership of experienced pediatricians, Drs Hemant Kairam and Ann Engelland, the team was in good hands as new volunteers, both pediatric residents and nurses dealt with the disappointment of not being able to carry out their mission in the flooded area. 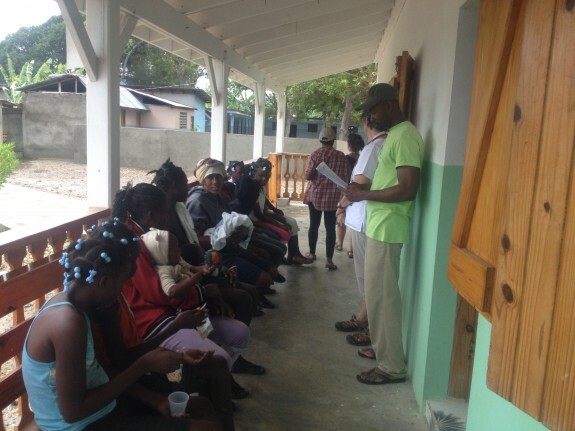 By Tuesday the rains had lightened enough that they were able to put together an outreach in the Haiti Village Health clinic on the property. 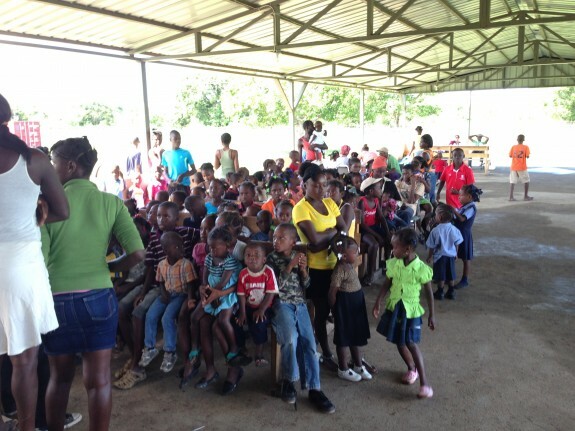 They saw as many children as possible and then packed up what they could and boarded a van to return to Cap Haitien. 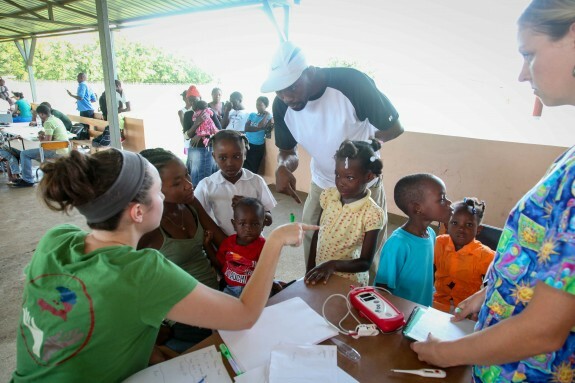 Patients lining up at the Haiti Village Health clinic. I had made the difficult decision to evacuate the team before roads became impassable. I knew this meant we would not be able to hold pediatric clinics in the villages that were expecting us. Conditions had worsened, however, and the safety of the team was the priority. Taking advantage of low tide, the team traveled back in the rain and took up shelter at the Volunteer Village. The Haiti Hospital Appeal staff went out of their way to make us feel comfortable. Never had a meal of grilled cheese and soup tasted so good. Dr. Mary Ann LoFrumento meets with the reunited team. Clothes and spirits were dampened, but by Wednesday morning, prayers were answered and the skies appeared to clear. It looked like the rains were finally ending. Photographer Audrey captured our smiles as we took the team photo. But what to do with the team? We had fourteen people ready to work and we needed clinics in new locations. We conferred with our partners in Cap Haitien. First stop, an orphanage about a half hour away called Helping Haitian Angels. They also served the community surrounding the orphanage and school which had no access to medical care. 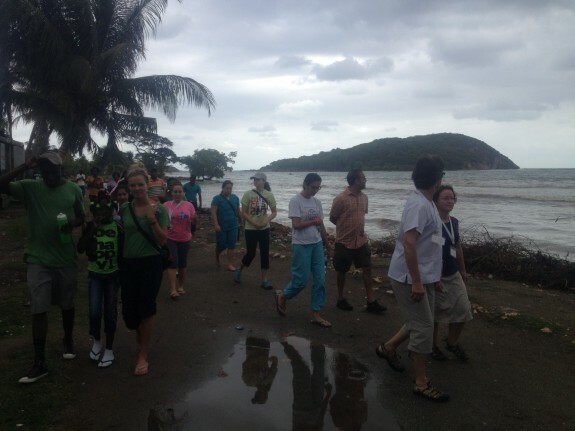 Community leaders went into the village and announced that our team was coming. Before we knew it a crowd had formed with mothers, fathers and many babies and children. 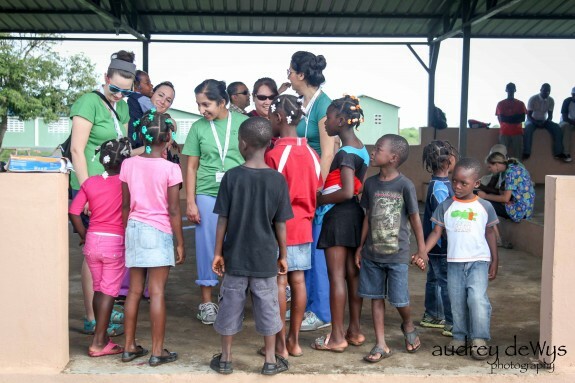 Patients arrive to our first clinic. We knew what to do, and the team sprang into action setting up six stations, each with a doctor, nurse, and translator. Triage was run by volunteer, Julianna Picciarelli who is studying to be a medical assistant and nurse Amanda Slanina from Canada. Children were weighed, measured, temperatures were taken and the sickest children were put at the front of the line. Finally, the team was doing what they came here to do. Our biggest challenge that day was what to do for a family with a severely malnourished child who was known to have untreated tuberculosis. All the children were at risk as well as the parents. We would need to access some help from the Cap Haitien Network and the Ministry of Health to get them the needed medications and treatment supervision. Without this, the entire family, as well as other villagers could become exposed to TB, a true public health emergency. Our in country team helped to coordinate the plan. At the end of the day, the team may have been tired, but they were all smiles as we finally got to work. Now what to do next? Saying goodbye to some new friends.